The proteasome subunit RPT5, which is essential for gametophyte development, is encoded by two genes in Arabidopsis thaliana; RPT5a and RPT5b. We showed previously that RPT5a and RPT5b are fully redundant in the Columbia (Col-0) accession, whereas in the Wassilewskia accession (Ws-4), RPT5b does not complement the effect of a strong rpt5a mutation in the male gametophyte, and only partially complements rpt5a mutation in the sporophyte. RPT5b Col-0 and RPT5b Ws-4 differ by only two SNPs, one located in the promoter and the other in the seventh intron of the gene. By exploiting natural variation at RPT5b we determined that the SNP located in RPT5b intron seven, rather than the promoter SNP, is the sole basis of this lack of redundancy. In Ws-4 this SNP is predicted to create a new splicing branchpoint sequence that induces a partial mis-splicing of the pre-mRNA, leading to the introduction of a Premature Termination Codon. We characterized 5 accessions carrying this A-to-T substitution in intron seven and observed a complete correlation between this SNP and both a 10 to 20% level of the RPT5b pre-mRNA mis-splicing and the lack of ability to complement an rpt5a mutant phenotype. The accession-dependent unequal redundancy between RPT5a and RPT5b genes illustrates an example of evolutionary drifting between duplicated genes through alternative splicing. Gene duplications contribute to evolution . They arose mostly through polyploidy (i.e. genome duplication) that has been a widespread phenomenon among Angiosperms . Arabidopsis thaliana has undergone several rounds of genome duplication and up to 23% of its proteome is encoded by duplicated genes . The evolutionary outcomes of gene duplication were first theorized by Ohno , who predicted that although duplicated genes are redundant at first, they soon evolve and one of the duplicates either accumulates detrimental mutations and is lost, or gains new function(s). As a consequence, over time the duplicated genes become partially or no longer redundant. In some cases, both genes may have retained unequal redundancy: a mutation in one of the two duplicated genes causes a mutant phenotype while a mutation in the other does not; in the double mutant, this phenotype is strongly enhanced  At its utmost, independent evolution of duplicated genes among close accessions is the basis of incompatibility known as the Dobzhansky-Muller type syndrome [6, 7]. Gene evolution can be assessed by studying natural variation in a single species. A recent survey highlighted that nucleotide sequence polymorphism appears in all gene regions, both coding and non-coding . In particular, alternative splicing, that creates multiple mRNA from the same gene unit, has been described recently as a source of variation among natural accessions. For example, this process alters FLC function in the Arabidopsis accession Bur-0  as well as in some Brassica rapa accessions . Although evolution through alternative splicing may contribute to the creation of new functions through exon sliding , it has mainly been described as inducing Premature Termination Codon (PTC). Transcripts affected by PTC are often targets of Nonsense-Mediated Decay (NMD), leading to their degradation [12, 13]. Interestingly, it has been shown that alternative splicing is often conserved between species as diverse as Rice and Arabidopsis, suggesting that this process has an important role in gene function . However, the extent of variation in alternative splicing among accessions in a single species is not known. In previous work we showed that two Arabidopsis genes, RPT5a and RPT5b, are necessary for the development of both gametophytes . These genes encode an AAA-ATPase subunit that acts as a component of the 26S proteasome machinery. Loss-of-function for both genes is male and female gametophyte lethal. In the Col-0 accession, both RPT5a and RPT5b genes act in a redundant manner. 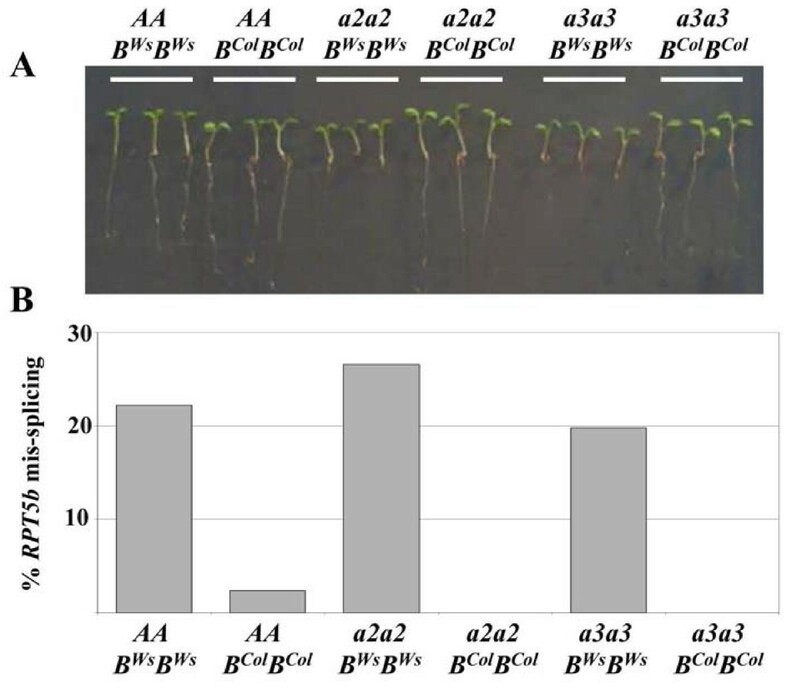 However, in the Ws-4 accession, RPT5b does not complement for rpt5a mutant phenotype in male gametophyte (and to a lesser extent in the sporophyte). Sequencing the 4800 bp RPT5b locus identified only two SNPs that differed between the RPT5b Col-0 and RPT5b Ws-4 genes, one located in the promoter (named SNP1) and the other at the end of the seventh intron (named SNP2). Those polymorphisms will be referred to as SNP1Ws (or SNP1Col) and SNP2Ws (or SNP2Col). These findings led us to suggest that inactivation of the RPT5b Ws-4 allele could be a result of either diminished RPT5b expression related to SNP1Ws, or else due to a mis-splicing event occurring at intron 7 related to SNP2Ws . Here we address this question by looking among 487 Arabidopsis accessions for RPT5b alleles with polymorphisms similar to those detected in the Ws-4 accession. Redundancy between RPT5a and RPT5b genes was then tested regarding each of these two SNPs. This approach allowed us to demonstrate that SNP2 is responsible for RPT5b inactivation through pre-mRNA mis-splicing, leading to PTC. This A-to-T variation in intron 7, which is shared by 5 unrelated accessions, is predicted to create a new branchpoint sequence upstream from RPT5b intron seven 3' splice site, leading to its mis-splicing. Our previous work focussed on two accessions for which Arabidopsis insertional mutant collections are available, Col-0 and Ws-4. We presumed that the two SNPs highlighted between the RPT5b Col-0 and RPT5b Ws-4 alleles were responsible for their different abilities to complement the male gametophyte lethal phenotype in a rpt5a background. We previously showed that a strong rpt5a-1 male gametophyte mutation was complemented by a transgene harbouring a 4 kb RPT5b Col construct . Likewise, 3 constructs were transformed into rpt5a-1/RPT5a plants, each harbouring the same 4 kb of RPT5b with different combinations of Col/Ws SNP1 and SNP2. It was tested whether those constructs would allow the transmission of rpt5a-1 through the male gametophyte (Additional file 1: Figure S1). Surprisingly, all 4 RPT5b constructs (SNP1Col SNP2Col, SNP1Ws SNP2Ws, SNP1Col SNP2Ws and SNP1Ws SNP2Col) did complement the rpt5a-1 mutation. The empty binary vector used as a control did not. It has to be noted that those transformed plants expressed the endogenous RPT5b Ws gene as well as the RPT5b transgene. It is very likely that the additive expression of the endogenous RPT5b together with the transgene is sufficient to complement the rpt5a-1 mutation and is therefore masking the partial loss of function of the RPT5b Ws allele. As a complementary approach, we looked for additional accessions displaying polymorphism at either the promoter (SNP1) or within intron 7 (SNP2) using previously designed dCAPS markers ( and Fig. 1A and 1B). 487 accessions from the Versailles Resource Centre were screened for both dCAPS (Fig. 1B and not shown). Both Col plants (Col-0 and Col-7) contained in the set of accessions displayed a Col/Col digestion profile (dCAPS SNP1/dCAPS SNP2) as well as the majority (468) of tested accessions. All five Ws accessions (Ws, Ws-1, Ws-2, Ws-3 and Ws-4) as well as 6 new accessions were found to display a Ws/Ws profile and 6 new accessions showed a Ws/Col profile. No accession that would present a (Col dCAPS SNP1/Ws dCAPS SNP2) profile was found. To confirm the first screening, 12 accessions were chosen (Table 1) and were grown for new genomic DNA extraction. Two 500 bp regions, each one encompassing one SNP, were sequenced to confirm the initial dCAPS screening (Fig. 1A). This was of particular importance as the dCAPS could only discriminate between non-Ws and Ws status (SNP1) and non-Col and Col status for SNP2. All sequence data showed that among the accessions chosen there were no variations other than those we previously described between Col-0 and Ws-4 (Fig. 1C). The identification of accessions with different haplotypes gives us the opportunity to test which SNP is responsible for the observed phenotype. Screening for RPT5b polymorphism among Arabidopsis natural variation. A, Graphic representation of RPT5b. Red boxes represent exons. The start of translation is indicated by a broken arrow. Both promoter and intron seven SNPs (respectively SNP1 and SNP2) are indicated. Double-end arrows located below RPT5b cover the 500 bp fragments that have been re-sequenced. B, Two dCAPS markers were used to discriminate SNP1 and SNP2 between Col and Ws accessions (see Methods). Results are also shown for the 8 selected accessions that show a non-Col signature for SNP1 and/or SNP2. C, Display of sequences around SNP1 (in promoter) and SNP2 (in intron 7) following partial RPT5b re-sequencing. The Col sequence is given as reference. Non-coding sequences are italicised while coding sequence (beginning of exon 8) are not. The first base of exon 8 is indicated by a star. For practical matter relative to plant crosses, we retained 4 accessions for each haplotype displaying about the same flowering time as Col-0 and Ws-4. Those selected accessions are: Bu-11, Cal-0, Da-0 and Wu-0 for the SNP1Ws/SNP2Ws haplotype, and Akita, Bsch-0, Sn5(1) and Uk-4 for the SNP1Ws/SNP2Col haplotype. 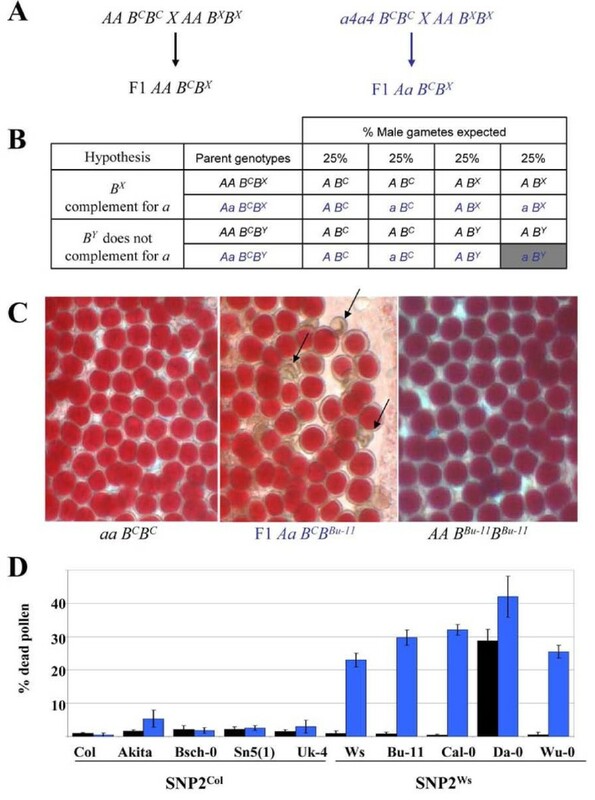 We previously showed that the Col-0 allele of RPT5b (RPT5b Col-0 ) rescued the male gametophyte defect due to rpt5a loss of function whereas RPT5b Ws-4 did not, showing that the RPT5b Ws-4 allele is not functional in the male gametophyte. Male gametophytes harbouring an rpt5a ; RPT5b Ws-4 genotype degenerate as shown by the vital marker Alexander staining . Pollen phenotype is readily checked on the F1 progeny from crosses between the rpt5a-4 mutant (in a Col-0 background) and any other accession: 100% of the pollen should be viable if the rpt5a-4 mutation is complemented -by RPT5b x - but only 75% will be viable if there is no complementation (Fig. 2A and 2B). Each selected accession was crossed to wild-type Col-0 to assess any incompatibility between accessions that is unrelated to RPT5. At the same time, each selected accession was crossed to homozygous rpt5a-4 mutants (rpt5a-4/rpt5a-4; RPT5b Col-0 /RPT5b Col-0 ) to test whether the rpt5a-4 mutation could be rescued by the various RPT5b alleles. Ws-4 and Col-0 plants were used as controls. F1 plants were grown and pollen viability was tested (Fig. 2C and 2D). For 7 out of the 8 tested accessions, no pollen incompatibility was observed: consequently the cross with rpt5a-4 mutant could be used to test the (lack of) complementation of the rpt5a mutation. Only one accession, Da-0 (SNP1Ws/SNP2Ws haplotype), was found to trigger incompatibility when crossed to Col-0. F1 Da-0 × Col-0 showed a 28% pollen lethality that would be consistent with 2 independent genes leading to pollen lethality and could correspond to another example of Dobzhansky-Muller type incompatibility . A SNP in RPT5b intron 7 correlates with unequal redundancy between RPT5a and RPT5b in pollen development. A, Schematic representation of the F1 crosses used in this study. A and a represent wild-type RPT5 and rpt5a-4 mutated allele, respectively. B C represents the Col allele RPT5b while X stands here for a non-Col accession. B, Gamete segregations for the F1 plants obtained in A. Two hypotheses are taken into consideration: that either the non-Col RPT5b allele complements the rpt5a mutation (B X , from the X accession) or that it does not (B Y from the Y accession). For each genotype, the percentages of expected gametes are indicated. Hence if the hypothesis is correct the percentage of dead pollen is either null or indicated by the grey column. C, Mature pollen stained with Alexander's stain in anther locules from a Aa4 B C B Bu-11 F1 hybrid and parents. Only the F1 plants show some dead pollen (indicated by arrows). D, Percentage of dead pollen determined by Alexander staining and subsequent counting in F1 AA B C B X (black boxes) and Aa4 B C B X (blue boxes where X stands for the accession written below the graph) plants. For each genotype, 300 grains were counted per plant. Values are shown as means on 4 independent plants (±SD). F1 progenies from crosses of rpt5a-4 mutant with Akita, Bsch-0, Sn5(1) and Uk-4 were found to display almost no dead pollen (Fig. 2D). This means that RPT5b Akita , RPT5b Bsch-0 , RPT5b Sn5(1) , and RPT5b Uk-4 alleles complement the rpt5a-4 mutation, in contrast to RPT5b Ws-4 . As these accessions have a SNP1Ws/SNP2Col haplotype, it can be concluded that the SNP1Ws is not involved in the process that impairs the RPT5b Ws-4 allele from complementing the rpt5a-4 mutation. 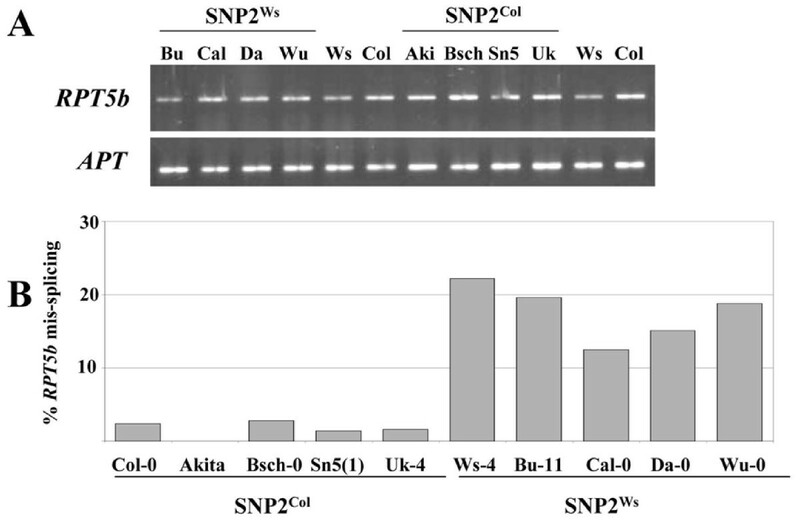 This is consistent with previous data showing that the promoter SNP1 did not seem to modify the GUS gene expression pattern when a 1200 bp promoter, either from Col-0 or from Ws-4, was fused to the GUS gene reporter . By contrast, in F1 progeny from crosses of rpt5a-4 mutant with Bu-11, Cal-0 or Wu-0, approximately 25% non-viable pollen was observed, as for rpt5a-4/RPT5a; RPT5b Col-0 /RPT5b Ws-4 plants (Fig. 2C and 2D). This pollen lethality shows that RPT5b Bu-11 , RPT5b Cal-O and RPT5bWu-0alleles do not complement the rpt5a-4 mutation. As these accessions have a SNP1Ws/SNP2Ws haplotype, and because SNP1 was shown not to be involved, we conclude that the SNP2Ws is responsible for the lack of complementation of rpt5a mutation. Likewise, rpt5a-4/RPT5a; RPT5b Col-0 /RPT5b Da-0 plants displayed 42% pollen lethality, while only 28% dead pollen was observed in a wild-type RPT5a background, which is consistent with an additive effect of the Col X Da-0 incompatibility described above and a rpt5a-4; RPT5b Da-0 male gametophyte lethality. Taken together, these data strongly suggest that the SNP2Ws, located in intron 7, is responsible for the lack of complementation of the rpt5a mutation by RPT5b loci. It had been previously shown that RPT5b is subject to alternative splicing at intron 7 . The alternatively spliced mRNA carries a 10 bp deletion at the beginning of exon 8 and consequently a frameshift resulting in a stop codon at the beginning of exon 8, leading to a much shorter predicted protein (35 kDa instead of 47 kDa) (Fig. 3B). In plants, as in yeast and vertebrates, exons are excised by a two-step reaction (Fig. 3A): firstly the 5' splice site is cleaved and there is formation of a lariat with the branchpoint that is usually located 18 to 40 nts upstream of the 3' splice site. Then, in a second step, the 3' splice site is cleaved and both exons are ligated. The 3' splice site selection results from the spliceosome scanning for the first AG dinucleotide downstream of the branchpoint . 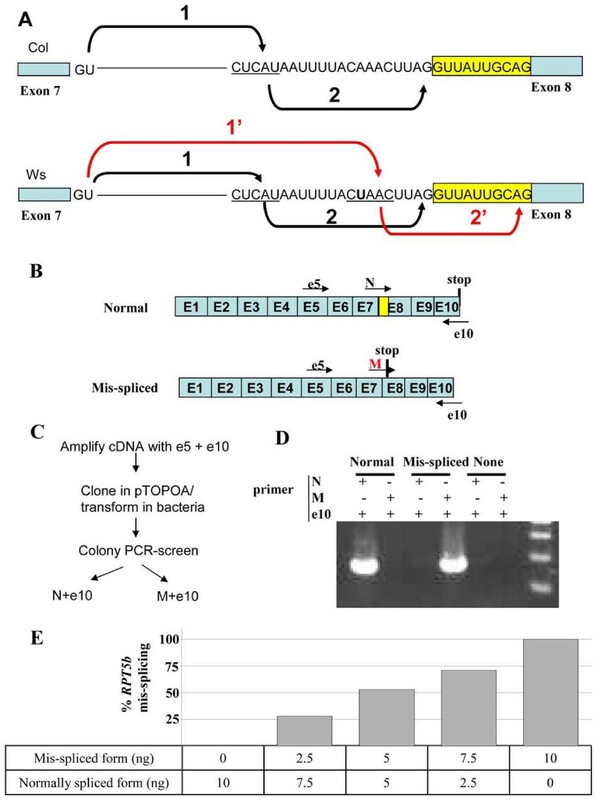 By analysing the intron 7 sequence in the Col-0 accession, one branchpoint sequence was found (CUCAU) that partially matches the plant consensus YURAY  with an A nucleotide located 18 bp upstream from the 3' splice site (Fig. 3A). By analysing the same intron sequence in the Ws accession, we found that SNP2Ws generated a new putative branchpoint consensus (CUAAC) that with its upstream sequence perfectly matches the yeast highly conserved sequence (UACUAAC). Therefore, although additional experiments would be required to prove that this sequence is a bona fide branchpoint [17, 18], this sequence is very likely to represent a branchpoint sequence that would compete with the upstream one. It has been shown that, particularly in mammalian genes, the 3' splicing site selection is defined by scanning for the first AG located 3' of the branchpoint , unless this AG is too close to the branchpoint (less than 12 nts), in which case steric effects would hamper the use of this AG in favour of a downstream AG . In RPT5b alleles harbouring a SNP2Ws signature, as the new branchpoint adenosine is located 6 nts from the 3' splice sequence, it is very likely that its use will trigger the spliceosome to scan until the next AG dinucleotide, leading to the mis-spliced RNA (Fig. 3B). Alternative splicing of RPT5b Ws . A, Hypothesis for the cause of alternative splicing at intron seven of RPT5b. Schematic representation of the Col intron with the different stages of splicing depicted: formation of a lariat between the 5' splice site and the branchpoint (1) and cleavage of the 3' splice site (2) before ligation of the two exon sequences. In the Ws intron, the SNP2 variant (U, in bold character) generates a new branchpoint sequence that activates the selection of a downstream 3' splice site. Exons are represented by boxes. The yellow box corresponds to the beginning of exon 8 that is spliced out in Ws. B, Graphic representation of mis-splicing occurring at RPT5b intron 7. Primers used for the cDNA amplification and for the splicing characterisation are represented (See methods). C, Strategy used to assess the level of mis-splicing at intron 7. Normal spliced forms are amplified with primers N and e10 while the mis-spliced form is detected by amplification with primers M and e10, as exemplified in D. E, Plasmids containing both e5-e10 fragments of the normally spliced and mis-spliced form of RTP5b intron 7 were mixed up to 10 ng, as indicated below the graph. The level of mis-splicing was then assessed as represented in Fig. 3C. At least 100 cloned cDNAs were tested per genotype. Results show that our test gives a good estimate of the mis-spliced form vs total form ratio. Hence, in our conditions, there is no significant bias of PCR amplification and/or cloning of one spliced form over the other. Previously, a test was developed to quantify the amount of RPT5b intron 7 mis-splicing among mRNA ( and Fig. 3C and 3D). Fragments of RPT5b cDNA surrounding intron 7 were cloned before analysis to make sure that the level of mis-splicing could be accurately assessed (Fig. 3E). However no significant difference could be detected in the level of RPT5b intron 7 mis-splicing between Col-0 and Ws-4 inflorescence . One explanation would be that the mis-splicing occurring only in male gametophyte cells or mother cells would be diluted by splicing occurring in surrounding tissues, making it very difficult to analyse at this stage. For this reason we looked at young seedlings, as these represent another developmental phase where RPT5a and RPT5b unequal redundancy is detected. In the Ws-4 accession, no homozygous plants are recovered for the strong mutant allele rpt5a-1, because it is fully male gametophytic lethal. However, two weaker alleles, rpt5a-2 and rpt5a-3, were isolated that show some residual transmission through the male gametophyte  and for which some homozygous plants were recovered. Those plants, rpt5a-2/rpt5a-2 ; RPT5b Ws-4 /RPT5b Ws-4 and rpt5a-3/rpt5a-3 ; RPT5b Ws-4 /RPT5b Ws-4 , show reduced development and the seedlings exhibit short roots. This phenotype was reversed to wild-type by introgressing the rpt5a-2 (or rpt5a-3) mutation into a RPT5b Col-0 /RPT5b Col-0 background ( and Fig. 4A), proving that the dwarf phenotype resulted from unequal redundancy between RPT5a and RPT5b Ws-4 . Therefore, RPT5b intron 7 splicing was assessed on six-day old RPT5a/RPT5a, rpt5a-2/rpt5a-2 and rpt5a-3/rpt5a-3 seedlings in either RPT5b Col-0 /RPT5b Col-0 or RPT5b Ws-4 /RPT5b Ws-4 background. A very clear correlation was observed between the presence of the RPT5b Ws-4 allele and a ratio of 20 to 25% of mis-splicing among RPT5b RNA, leading to PTC (Fig. 4B). RPT5b Ws cDNA is partially mis-spliced, regardless of RPT5a status. A, 6-day old seedlings grown on vertical agar plates from wild type RPT5a plants and rpt5a2/rpt5a2 and rpt5a3/rpt5a3 in either RPT5b Col-0 /RPT5b Col-0 or RPT5b Ws-4 /RPT5b Ws-4 background. B, Percentages of RPT5b intron 7 mis-splicing in the same plantlets as in A. At least 100 cloned cDNAs were tested per genotype. A similar study was carried out on all 8 accessions selected above as displaying a SNP1Ws/SNP2Ws or SNP1Ws/SNP2Col haplotype (Fig. 5A). A perfect correlation was observed between the presence of SNP2Ws and a significant amount of mis-splicing at intron 7 (12 to 20%). Conversely, all 4 accessions with a SNP1Col/SNP2Col haplotype showed a very limited amount or undetectable mis-splicing (0 to 2.8%) (Fig. 5B). Partial RPT5b mis-splicing correlates with RPT5 unequal redundancy. A, RT-PCR on mRNA isolated from 6-day old seedlings from different accessions. APT was amplified as a control. B, Percentages of RPT5b intron 7 mis-splicing in the same plantlets as above. At least 100 cloned cDNAs were tested per genotype. This demonstrates that SNP2Ws, located upstream of the 3'intron site consensus, is very likely responsible for a significant amount of mis-splicing that causes the lack of complementation of rpt5a mutation by RPT5b alleles carrying this SNP2Ws. In the present study, we confirm that RPT5a and RPT5b display unequal redundancy in some Arabidopsis accessions and we characterized 4 new accessions in which the situation is similar. Moreover, by investigating Arabidopsis natural variation, we show that one SNP, located in RPT5b intron seven, causes this unequal redundancy between RPT5a and RPT5b genes. The A to T substitution in position -8 to the intron 3' splice site correlates with a 25% mis-splicing rate in Ws-4 and in 4 other accessions (Bu-11, Cal-0, Da-0 and Wu-0). Sequence analyses reveal that the SNP2Ws generates a new putative branchpoint sequence that probably competes with the original branchpoint. As a result, another 3' splice site is selected downstream, resulting in a 10 bp deletion in the RPT5b mRNA. However, how this competition occurs between both branchpoint sequences, and consequently both 3' splice sites is unclear. In mammalian genes, despite the steric hindrance caused by the closeness between the branchpoint and the next downstream AG dinucleotide, AG sequences located as close as 4 nt downstream of the branchpoint would still be used at some extent . Data suggest that 3' splicing site scanning occurs in plants as in mammals [17, 21], explaining why even in the presence of SNP2Ws, the first AG remains the main 3' splicing site. In the 5 accessions carrying SNP2Ws, only a fraction of RPT5b pre-mRNA is mis-spliced (between 12 and 25%), though our assay might underestimate this percentage if some of the mis-spliced form is degraded through NMD, as it is frequently the case with mRNA displaying PTC [13, 22]. However, semi-quantitative RT-PCR shows that RPT5b mRNAs accumulate similarly in all accessions we tested (Fig. 5A). The subtle defect in RPT5b pre-mRNA splicing may also explain why transgenes expressing various RPT5b constructs all complement a rpt5a strong male gametophyte defect: the additive expression of both the transgenic and endogenous RPT5b expression is probably sufficient to overcome the lack of RPT5a by providing enough functional RPT5b. Presumably, this SNP2, through causing a "mild" effect on splicing, is likely to have a stronger effect on RPT5b protein accumulation with deleterious consequences on both male gametophyte and sporophyte development. Indeed, F2 plants that segregate with a rpt5a-4/rpt5a-4; RPT5b Col-0 /RPT5b Bu-11 genotype displayed a short root that is typical of mutants partially affected in the proteasome machinery such as rpt2a, rpn10 and rpn12 as well as weaker alleles of rpt5a [15, 23, 24] (Data not shown). This suggests that the unequal redundancy between RPT5a and the other RPT5b alleles bearing the SNP2Ws extend to sporophyte development. We previously pointed that while the lack of redundancy between RPT5a and RPT5b Ws-4 has a dramatic effect on male gametophyte development (leading to pollen lethality) it has no or very little effect on the female gametophyte development . Several studies point out that alternative splicing can be regulated by hormones, stresses or developmental cues (i.e. the pattern of alternative splicing can be organ-specific) [25–27]. In this regard, it is interesting to note a recently described set of mutants that impair female gametophyte development: LACHESIS, CHLOTO/GAMETOPHYTIC FACTOR1 and ATROPOS are essential for female gamete cell fate and all three genes encode spliceosomal components [28, 29]. The authors speculate that splicing regulation could be required for maturing specific gametophytic factors mRNA. Likewise, it could be that male gametophytes also have a specific spliceosome machinery that would make them more susceptible to SNP2 Ws related-alternative splicing while the female machinery would not. It will be interesting to see whether mutations affecting male-gametophyte development will be discovered by screening for more mutations of the spliceosome machinery. The RPT5b alternatively-spliced mRNA described here leads to PTC that is supposed to induce NMD , i.e. degradation of the mRNA to prevent the translation of an incomplete protein. Although alternative splicing has been proposed as a way to generate novel proteins and therefore enhance transcriptomic/proteomic plasticity, there are no indications that this is the case here: the present alternate splicing leads to a RPT5b devoid of the conserved AAA-ATPase domains H and K [30, 31] that is likely to be a non-functional protein as is the C-term deleted RPT2a protein in the hlr-2 mutant . Besides, PTC caused by alternative splicing has been demonstrated to act as a way to regulate gene function by the RUST mechanism (Regulated Unproductive Splicing and Translation) : it triggers the production of mRNAs encoding non functional proteins and those mRNAs are the targets of NMD. However, we found that the level of RPT5b Ws-4 mis-splicing was similar in seedlings in both wild-type RPT5a background and in rpt5a-2 or rpt5a-3 mutant background (Fig. 4B), suggesting that there is no feedback on RPT5b mis-splicing based on RPT5 protein content. Alternative splicing has been extensively assessed in Arabidopsis  showing that up to 42% of intron-containing genes are alternatively spliced. The majority of those alternate transcripts lead to PTC, suggesting it has an important role for gene expression regulation. New sequencing methods as High Throughput Sequencing [33–35] offer the opportunity to assess how alternative splicing varies between accessions and to see how it can contribute to transcriptomic/proteomic diversification among natural variation. RPT5a and RPT5b both encode the RPT5 subunit, a component of the Regulatory Particle of the 26S proteasome, the complex that degrades ubiquitin-labelled targets as part of the Ubiquitin proteasome System (UPS) . The 26S/UPS is an essential pathway involved in development and regulatory processes in eukaryotes, including plants [37, 38]. In Arabidopsis, most of the 26S proteasome components are encoded by duplicated genes  and it is not clear whether these duplications are the basis of a mere redundancy or of a proteasome plasticity. In this regard, assessing the redundancy between RPT5a and RPT5b among natural variation in Arabidopsis thaliana brings new insights by showing that these genes offer another example of unequal redundancy  through alternative splicing in some unrelated accessions, without any apparent gain of functions. A recent study carried out in Arabidopsis shows that alternative splicing plays an important role for divergence between duplicated genes . It would be interesting to test whether other proteasome subunits display such incompatibilities and therefore determine whether some of those other duplicated genes are drifting away or not. Arabidopsis thaliana Columbia (Col-0) and Wassilewskija (Ws-4) accessions were used as reference plants. The rpt5a-4 T-DNA insertion mutant allele has been already described . It was isolated in the SALK collection as line S046321 in Col-0 accession (SIGnAL; http://signal.salk.edu/cgi-bin/tdnaexpress). As previously, the rpt5a-4 mutant allele was genotyped with the S46321-L and LBSalk2 primers while the wild-type allele was scored with S46321-U and S46321-L. All primers are described in Additional file 2: Table S1. The 487-accessions collection (Additional file 3: Table S2.) was provided by the Resource Centre of INRA Versailles http://dbsgap.versailles.inra.fr/vnat. All Col (Col-0 and Col-7) and Ws accessions (Ws, Ws-1, Ws-2, Ws-3 and Ws-4) were found to present the same RPT5b haplotype; therefore only Col-0 and Ws-4 was used in this study. For growth on either plates or soil, seeds were stratified for 2 days at 4°C and grown at 18 to 20°C, with 16 h light (fluorescent lights: 100 μmol photons m-2 s-1) and 8 h dark cycles. Immature flowers were emasculated and manually cross-pollinated for crosses. Genomic DNA of the 487 accessions was extracted in 96-well plates from seedlings, using a SDS-based buffer . 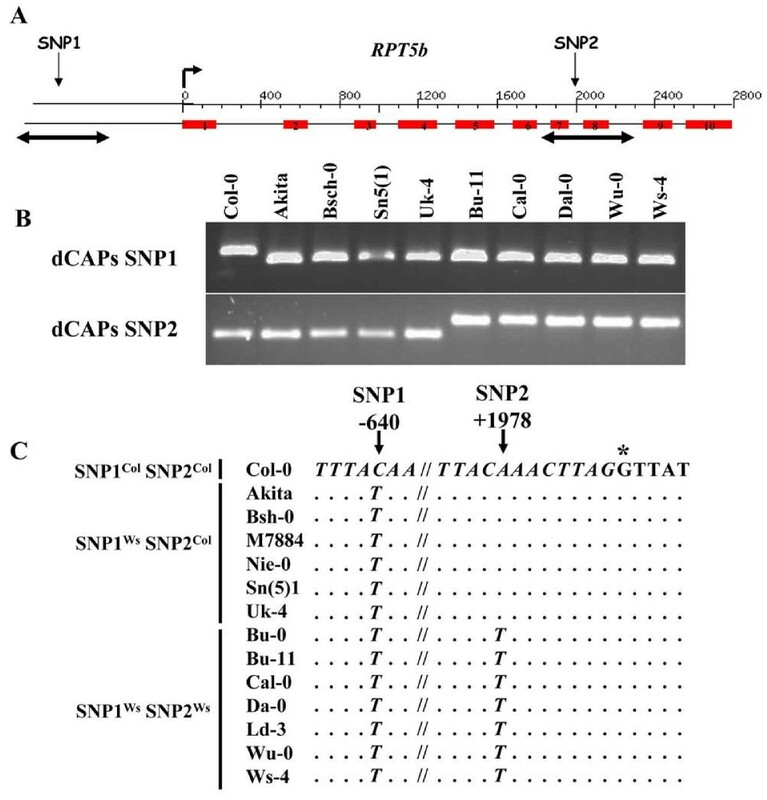 SNP1 and SNP2 were detected as previously reported using dCAPS markers . For the SNP1 located in the RPT5b promoter, a 266 bp fragment was amplified with primers JLV096 and JLV097 and digested with VspI. Only the fragment originating from the Ws allele was restricted into 249 and 17 bp fragments. For the SNP2, located in the RPT5b intron seven, a 280 bp fragment was amplified with primers RPT5b-3369 and RPT5b-Hind3 and digested with HindIII. Only the fragment originating from the Col allele was restricted into 250 and 30 bp fragments. Pollen viability was assessed using Alexander staining  and observed with a PL Fluotar X25 dry objective on a Leitz Diaplan microscope. Total RNA was extracted using TRIZOL-reagent (Invitrogen) from 100 mg of tissue (6 day-old plantlets). Contaminating DNA was removed by DnaseI treatment with RNase Free DNase set (Qiagen) using spin columns of the Rneasy Plant mini kit (Qiagen). RT-PCR was performed with RevertAid H Minus M-MuLV Reverse Transcriptase (Fermentas) on 500 ng RNA according to the supplier's instructions. RPT5b and APT cDNAs were amplified with specific primers: e5 and e10 for RPT5b, APT5' and APT3' for APT. RPT5b e5-e10 cDNA fragments were amplified by 25 cycles of PCR with e5 and e10 primers. The PCR products were then cloned into pTOPOII plasmid (Invitrogen) and the resulting constructs transformed into DH10B competent cells. A hundred recombinant clones were analysed by PCR using N and e10 primers for normal cDNA detection and M and e10 primers for mis-spliced cDNA. We thank Christine Camilleri for her very helpful advice on both the project and the manuscript. We are also very thankful to Raphaël Mercier for his advice that helped to improve the manuscript and to Matthieu Simon for his help with the accessions and the use of MSAT markers. Finally, we thank Denis Headon (Roslin Institute, Edinburgh, UK) for editing the manuscript. AGD and JLG designed the experiments. AGD, AL and JLG carried out the experiments. AGD and JLG wrote the manuscript. SB and PG participated to the writing. All authors read and approved the final manuscript.